So I was searching all over the internet for the new Myspace logo to implement into one of my websites that has a Myspace page as part of the social media outlet backlinking… even though I hardly know anyone that still uses it. I couldn’t find a single one set of social media outlet logos that has the NEW Myspace logo design, so I decided to make my own. I have decided to quit red meat, well, beef to be exact. The reason I choose to steer free of this deliciousness is not without justification or logic, and definitely something not of fad. It’s actually something that I have come to a conclusion that involves a combination of the following: the way we Americans consume beef, the treatment of the animal, and my personal beliefs and opinions about the animal. Growing up in China, our family ate more fresh fish, poultry, and pork than beef. Reason being is that Chinese beef is a lot leaner, which isn’t nearly as fatty (or marble-y) as their American cousins. When I was a kid, I have always felt bad eating my “生肖” or my Chinese zodiac because I was born in the year of the ox, but I still eat it because my mom made sure that it tasted so good after soaking it in marinade that I couldn’t resist. I always liked cows, they were mostly used as the beast of burden for Chinese agriculture. Flash forward to when my family and I moved to America, where the red meat is tasty and it is copiously consumed, and its the only kind of meat you should really eat, or so that’s what my mom told me. Because of these reasons, I had to adjust my eating habits and began eating large quantities of beef. The fact that my mom made beef everyday and there’s a McDonald’s a mile away from our house didn’t help either. I loved beef, actually I still love it, but I just don’t eat it anymore. Ethical reason: Honestly, as a country we can definitely get away with consuming less beef altogether, but that’s just my personal opinion of the matter… and don’t even get me started on the plethora of evidence of inhumane and unjustifiable treatments of cows. But because our entire country is based on a food culture that surrounds that big piece of steak as the main source of diet in American cuisine, we have lost sight of what is actually a balanced diet. The amount of beef we eat is insane. What we eat in a week is often tenfolds of what people in other countries eat in a month, and the world’s wealthy meat-eaters are put in direct competition with the world’s mainly vegetarian poor for grain (cows need grain, poor people need grain, we only have so arable land!). Did you know that in most countries other than Australia and United States, beef is actually way more expensive than seafood? We also consume a lot more than any other countries on the planet, especially when it comes to beef. To satisfy such a demand, we turn our dairy cows into one of the main sources for beef production, and I am just not okay with that… this is where it my philosophical reason below comes in. Philosophical reason: A good friend of mine is a Sikh, I asked him why he never ate beef, and his religious reasons. His simple answer was, “Why would you eat or kill an animal that gives you milk, and helps you cultivate food?” When he said that to me, my entire perspective on beef consumption changed. Environmental reason: Scientists at Japan’s National Institute of Livestock and Grassland Science estimate that producing a kilogram (about 2.2 pounds) of beef emits more greenhouse gas than driving 155 miles. It takes seven times as much grain to produce 2lbs of beef as it does 2lbs of chicken. The fact that grass-fed cows actually have a bigger carbon foot-print than their grain-fed counter parts, eating beef is not very green altogether – no matter how you justify it. 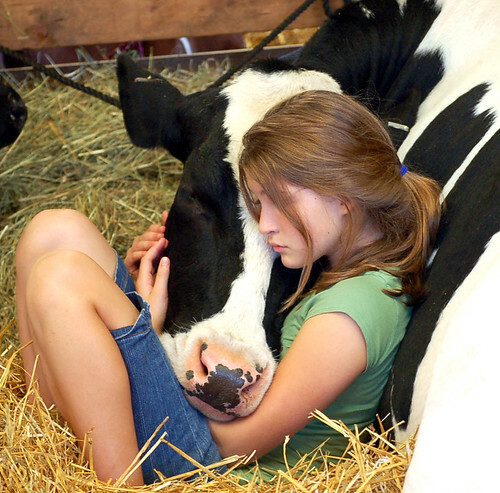 Did you know that cows make wonderful farming animals? They are often used (pre-agricultural industrialization) to plow fields, where their basic purposes was to serve as working animals. Personal reason: Remember how I said when I was little, I didn’t want to eat beef because I was born in the year of the ox? Well, as silly as that might sound, it’s coming back to me again. All of this started to occur around the same time when I did my research on the dairy industry in the central valley for my advance literary journalism class (MA)… I got to meet some really nice farmers who treated their cows very well, where most of them take care of their cows like they would take care of their own children. While I was visiting some of these dairy farms, I actually got to meet a lot of the baby calves. Let’s just say, after seeing how cute they were when they’re just a few months old, I could never touch veal, or think about beef the same way ever again. Occasionally, I’ll eat some mixed meat products that contains beef… and I wouldn’t know until afterwards, and I’ll feel really gross after, for not only abandoning my personal belief but also my lack of precautions. I don’t pass judgement on anyone that does eat it, and I don’t try to enforce my beliefs upon others either. I try to stay as far away from beef as I can, because I know not only does my body not need it, it’s just better that I don’t eat it, for the reasons listed above. Yes that’s right! Amongst 60 pages of research papers and wedding season coming into full swing (I play in a professional string quartet and also makeup that cater to the wedding crowd), I am adding on Panda’s website as one of my to-do list for spring. Bryce is going to help me code the website, which I am extremely grateful for since I loath the coding process. For one, I am a terrible coder, and I much prefer the “creative” aspect of design over coding. You can see some of Bryce’s recent design and coding projects here: Small Space Workout and also the Game Help Forum. I feel terrible for not updating this blog as often as I should be. While we’re on the topic of cooking and recipe blogging, I have finally found the recipe for making the most fluffy, bouncy and soft dough to go with my Chinese style sausage and green union baked buns. I’ll post my recipe at my cookbook.